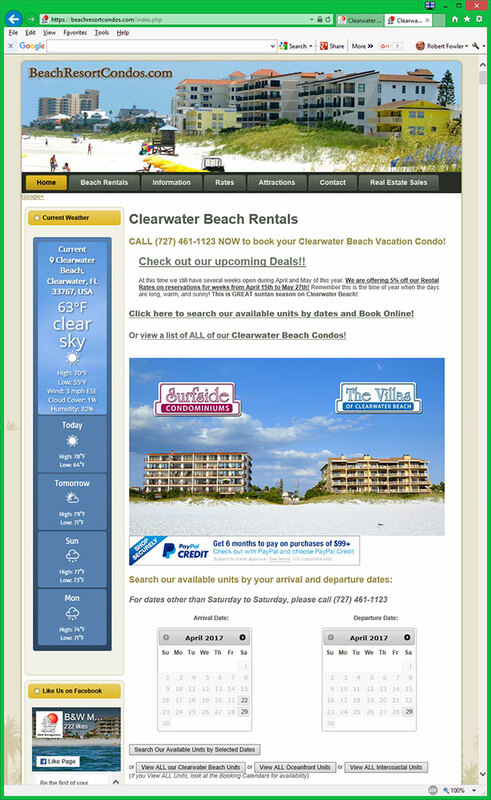 Welcome to Clearwater Beach Blog! We, the team at B&W Management, are happy to present this Clearwater Beach Blog for our Beachfront Vacation Condo guests and website visitors. Clearwater Beach Memorial Day weekend is a lot of fun and a great way to relax, have fun and spend time with family and friends! Need a place to stay on Clearwater Beach? Surfside Condominiums and The Villas of Clearwater Beach have condos available for the week of Memorial Day! ﻿ Tuesday, May 22 through Sunday, May 27. The 2018 American Athletic Conference Baseball Championship will take place at Spectrum Field, in Clearwater, Florida. Click here for more information and the championship schedule. Explore the unique and inspiring friendship between Salvador Dali and the father of conceptual art, Marchel Duchamp at The Dali Museum. This is the first exhibit dedicated to their friendship and their influence on both artists. The exhibit is open now through May 27, 2018. Open now through May 29th, experience the beautiful artwork dedicated to Dia de los Muertos (Day of the Dead) from 42 different artists from around the country. For more information visit www.floridacraftart.org or call (727) 821-7391. Admission is free! Have a fun and relaxing evening playing in clay at the Moeran Center for Clay on Friday, May 25th. Grab some friends, a towel, and your favorite beverage for a fun night of wheel throwing and hand building clay art. At the end of the night, select your favorite piece and the Moeran Center for Clay will bisque and glaze it for you to bring home. Purchase tickets today! Learn the history of Safety Harbor and it’s fascinating stories including how the Tocobaga protected us from the hurricanes, haunted hotels, the story of the swamp ape, UFO sightings and healing waters during a two-hour walking ghost tour. Every Thursday, Friday and Saturday with tickets starting at $20. Dogs are welcome to join! Call (727) 686-8785 or visit www.safetyharbortours.com for reservations. May is one of the best months to visit Clearwater Beach, Florida. The high temperatures for Clearwater Beach in May usually average between the mid 70°s and low 80°s. The Clearwater Beach Weather for May 2018 is looking to be a little bit warmer than usual. The first half of the month will have high temperatures in the low to mid 80°s and the second half of the month will have high temperatures in the mid to high 80°s. The warm weather will be joined by the beautiful sun! There are usually only 4 days with rain in May for Clearwater Beach, and the longterm forecast for May 2018 is looking to match that. Clearwater Beach Taste Fest: The 9th annual Clearwater Beach Taste Fest will be held on May 4, 2018 from 6:00 PM to 9:00 PM. Come on down to Pier 60 and enjoy tasting foods from over 30 local restaurants, premium wines, craft beers, live entertainment, and fireworks! Purchase tickets now! AAC Baseball Championship: The American Athletic Conference Baseball Championship will be returning to Clearwater, Florida! The AAC Baseball Championship will be taking place at Clearwater’s Spectrum Field from May 22nd through May 27th. View more information here. Clearwater Beach Sunset Festivals at Pier 60: Every day all year long! Celebrate the beautiful Clearwater Beach sunsets at the daily sunset festivals! Sunset Cinema at Pier 60: Enjoy a free movie at Pier 60 under the stars! Clearwater Farmers Market: Every Saturday from 10 AM – 2 PM! Click here for more information. Gulfport Tuesday Morning Fresh Mark: Every Tuesday Morning at 3000 Beach Blvd S, Gulfport, Florida 33707. Florida CraftArt Presents: “Dia de los Muertos – A celebration of Life”:5/1/2018 – 5/29/2018. Monday – Saturday; 10 AM – 5:30 PM. Visit www.FloridaCraftArt.org or call (727) 821-7391. Admission is free. Operation Finale: The Capture & Trial of Adolf Eichmann: 5/1/2018 through 7/15/2018. Pinellas Ale Works presents Fifty Shades of Color: The Art of Anne Walker: 5/1/2018 – 5/24/2018. Free and open to the public! Sip on brews and walk through the solo exhibit of Anne Walker. Shayna Leib: Into the Deep: 5/1/2018 – 5/13/2018. Art exhibition at Chihuly Collection features Shayna Leib, an artist, diver and underwater photographer. American Stage in the Park: The Producers: Mel Brooks’ classic comedy! Weekly on Sundays, Wednesdays, Thursdays, Fridays and Saturdays from 5/1/2018 through 5/13/2018. Dali/Duchamp Exhibit: 5/1/2018 through 5/27/2018. Mountainfilm Festival: 5/4/2018 through 5/5/2018 at The Don CeSar on St. Pete Beach. Kentucky Derby Day Formal at Intermezzo: 5/5/2018. Watch the Kentucky Derby live and enjoy Mint Juleps, Bloody Mary’s, Oyster Raw Bar and more! May Day Race: 5/5/2018. Choose from a 10k, 5k, or a kids’ dash and stay after for food, stretching, vendors and music! Old Crowe Medicine Show at Jannus Live: 5/6/2018. Doors open at 7 PM and the show starts at 8 PM. Buy tickets today! Screening of Lea and Mira and Holocaust Survivor Talk: 5/10/2018. The screening of ‘Lea and Mira,’ a story of two elderly Polish Jewish women who as children were taken to the Auschwitz concentration camp. Following the film, local Holocaust Survivor Pieter Kohnstam will share his personal experience of escaping Nazi Europe to Argentina. To reserve your seat, call 727.820.0100 ext. 301. Free and open to the public! St. Pete Beach Beer Festival: 5/12/2018. Sample over 50 beers from national and local craft breweries! St. Pete Taco & Beer Fiesta: 5/18/2018. Over 20 food trucks featuring delicious South American dishes. Free Yoga at Sundial St. Pete: 5/19/2018. Free outdoor yoga at the courtyard at Sundial St. Pete. Check-in starts at 8:30 AM and yoga begins at 9 AM. 97x Barbecue & Music Festival: 5/28/2018. A day full of live music, art exhibits and delicious barbecue! This year’s lineup features Dirty Heads, Awolnation, Judah & The Lion, AJR and more! While there are many things to do when visiting Clearwater Beach, there are also other parts of Florida worth experiencing. Many of these places are just a relatively short distance from Clearwater Beach and can make a great day trip! 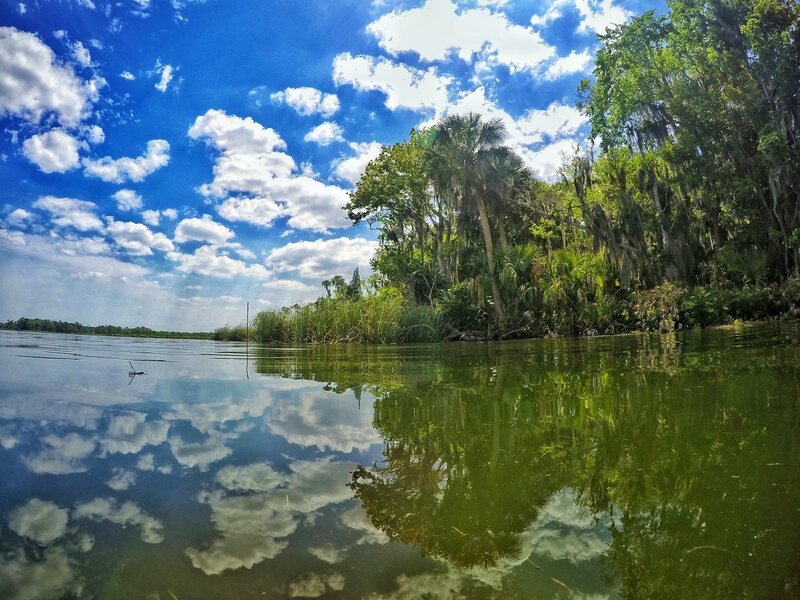 Crystal River, Florida definitely makes the list of places to go if you’re looking for a fun day trip location. Crystal River, Florida is located on the Gulf Coast just an hour and forty-five minutes north of Clearwater Beach. (Click here for directions.) Crystal River, Florida has become known as the “Home of the Manatee”. Manatees flock to Crystal River, Florida each fall and spend the winter enjoying the warm water in the area. As the water temperature of the Gulf of Mexico drops, the Three Sisters Springs of Crystal River, Florida keeps the water in the area much warmer. The Three Sisters Springs maintain a water temperature of 72 degrees throughout the entire year! The springs also keep the water crystal clear, hence the name – Crystal River. 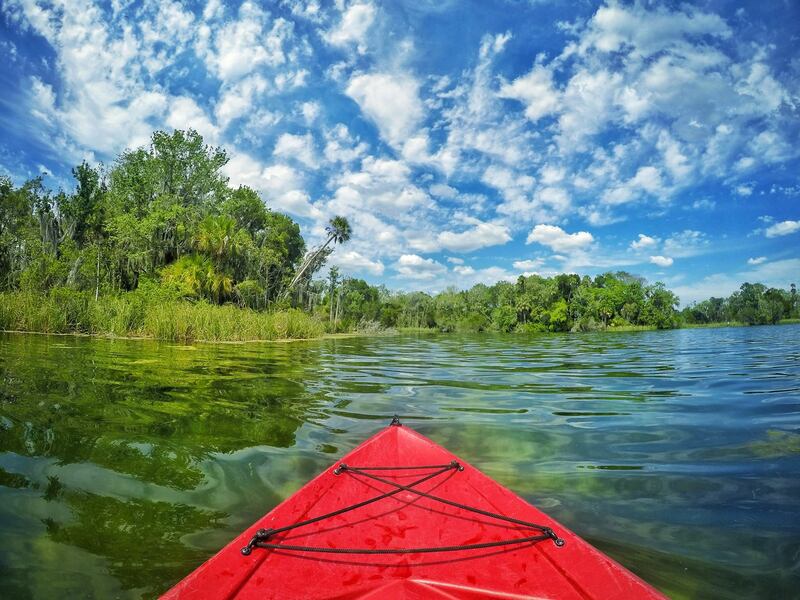 The clear and warm waters of Three Sisters Springs not only attracts manatees but also makes the Crystal River area an amazing location for kayaking! 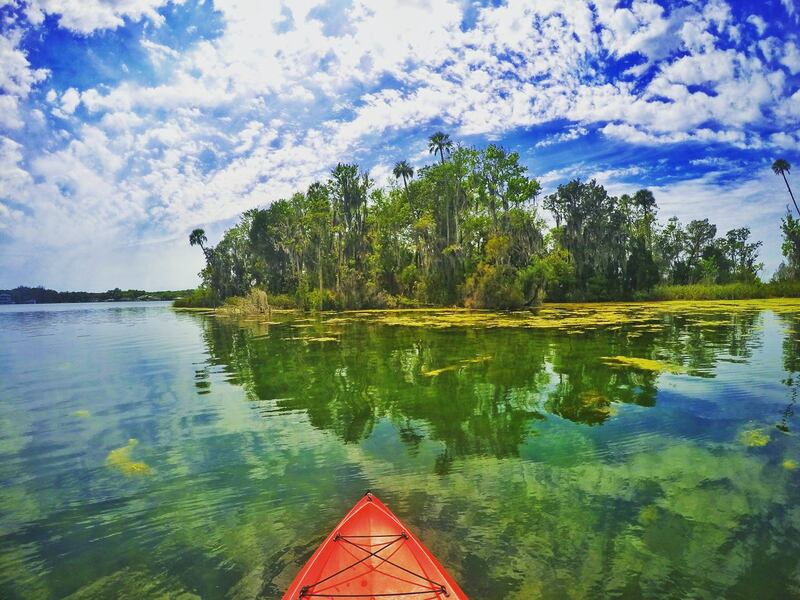 The ideal time to go to kayaking at Crystal River is during late September, through the winter, and into March. This is when the water of the Gulf of Mexico is much cooler, and the warm waters of Three Sisters Springs attract manatees to the area. Three Sisters Springs is part of the Crystal River National Wildlife Refuge and the King’s Bay Manatee Refuge. During the cooler months of the year, this area becomes home to the largest population of manatees in the world! 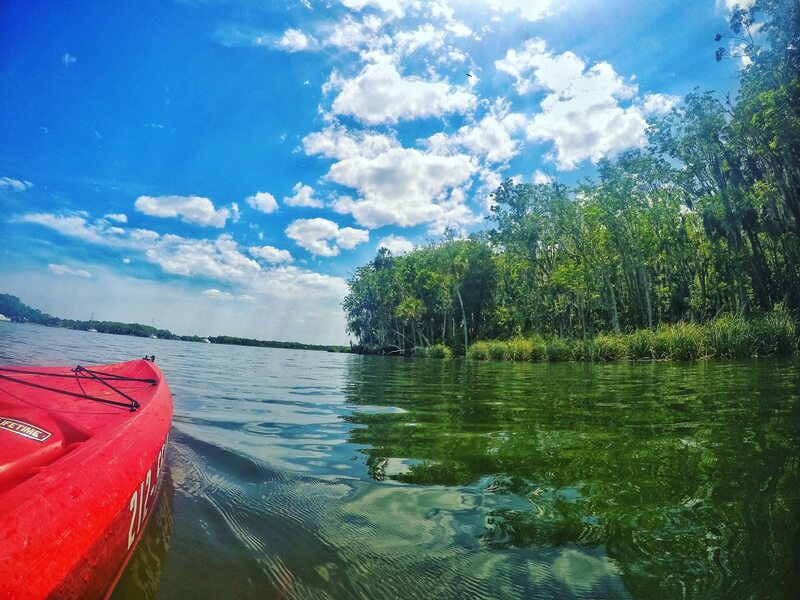 While the coolers months are when you’re most likely to see manatees, the Crystal River area is a beautiful area for kayaking no matter what time of year it is. You can bring your own kayaks, or you can rent kayaks in the Crystal River area. When I went kayaking in Crystal River, Florida, I rented from Hunter Springs Kayaks. Hunter Springs Kayaks offers guided tours, kayak rentals, paddle board rentals and kayak/paddle board hybrids for those who are new to standup paddle boarding. Hunter Springs Kayaks is located just a few blocks from the water. This provides plenty of free parking and a very short walk to the water. Don’t worry about carrying your kayak or paddleboard. All rented equipment is transported down to the water for you! While I haven’t been kayaking in Crystal River, Florida during the Manatee Season (Late September through early April), I still had a great time kayaking through the beautiful area. I was able to see a few manatees and dolphins as I kayaked around the Crystal River National Wildlife Refuge. The entire area truly is beautiful! After kayaking in Crystal River, Florida, I drove a slower way back to Clearwater Beach. I stayed off the major highway and drove south on 19, giving me the opportunity to stop at one of my favorite places for dinner, Hellas Restaurant, in Tarpon Springs.